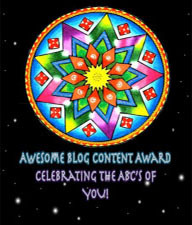 Many thanks to Shree over The Heartsongs Blog for nominating me for the Awesome Blog Content award a few weeks ago! If you haven’t visited Shree yet, you should – when she’s not writing thought-provoking posts, she’s doing beautiful artwork and mandalas like the one she drew for the ABC award above. Due to time constraints and my innate laziness, when I receive a blog award I generally link back to a couple of my earlier posts here and here. After all, I figure there’s only so much anybody really wants to know about me, and I think we’re all grateful if I don’t veer off into “too much information”. But this is a format I haven’t done before and I thought it was fun. And I couldn’t resist Shree’s beautiful hand-drawn award! A – Animals. Love ‘em all! Yes, even snakes. And especially cats, frogs, and salamanders. B – Books. I’m an addict. I start to get the shakes if I don’t have at least three books waiting to be read. D – Dresses. All forms of dressing up are to be avoided whenever possible. E – Eh. Yep, I’m Canadian. F – Food. At any hour of the day or night! G – Gardening. I’m incapable of leaving a patch of soil undisturbed. H – Home. My favourite place. I – Infantile. My sense of humour. J – Jokes. I love any kind of wordplay, even puns. Okay, I’ll admit it. Especially puns. K – Keystone. I grew up in Canada’s “Keystone Province”: Manitoba. L – Laugh. I do that a lot. Frequently when I shouldn’t. M – Milk. My favourite beverage. Yes, I like it even better than beer. Shocking, I know. O – Onomatopoeia. A mostly-useless word that refuses to leave my brain, taking up valuable memory space along with my grandparents’ phone number from 1970 and my very first credit card number. You’d think there would be a way to purge that stuff and fill the space with something more useful. Like maybe some current phone numbers. P – Popular. What I wasn’t in school. R – Restaurant. I love eating in restaurants, particularly ones that serve food I can’t (or won’t) make myself. T – Tools. I love tools. Automotive tools, carpentry tools, cooking tools, you name it. Tools, books, and food are the three types of purchase that never need justification in our house. U – Urban. The opposite of where I like to live. W – Wild. My imagination. X – Xenophobic, I ain’t. Y – Yellow. My favourite colour. 1) Thank and link back to who nominated you: Done! 2) Say something about yourself with a word or a phrase beginning with each letter of the alphabet. Done! 3) And of course nominate some other bloggers for the award. I know a lot of these bloggers don’t generally accept/participate in blog awards, and that’s perfectly fine – I mean this as a compliment, not an obligation. 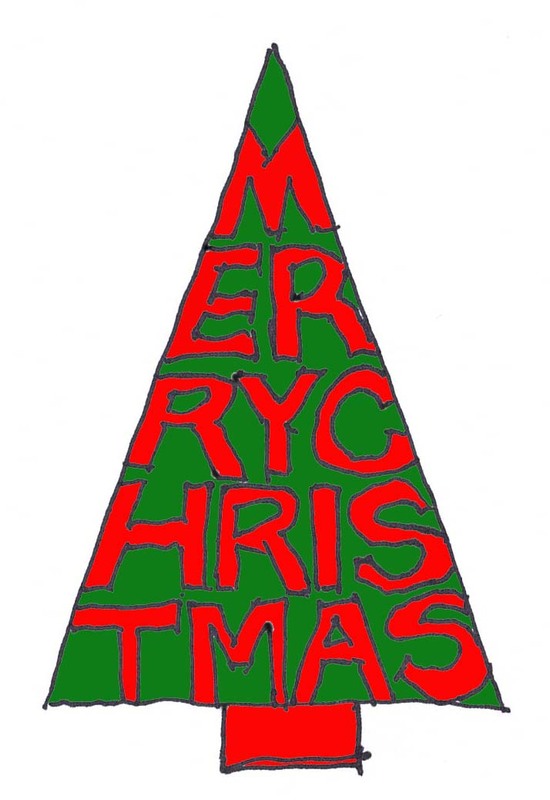 If you celebrate Christmas, I wish you a very merry one! Update: Winners have been drawn for the Spy, Spy Away book giveaway contest – click here to check ’em out! Awww, thanks for the shoutout, Diane! I’m sorry I’m late to the party (story of my life these days, I’m always running behind). Your A-Z sounds a lot like mine, except for the Canadian parts and Urban being the opposite of where I like to live. Are you really restoring a ’53 Chevy? SWEET. I used to date a guy who had a ’66 Mustang. It was a honey of a car. Sadly, that was the best thing about him. If I could have any car, I would want a ’57 Studebaker. I think Studebakers are extremely cool. Wacky looking, but cool. Happy New Year to you and the Mr. ! Holy crap, you learned to drive in a ’53 Chevy? You just get cooler and cooler, Diane. Love your list! Especially your “S” — silence is underrated. You’re welcome – I’ll look forward to your post! I read your post and then had to wander off to do other stuff. I finally got a chance to come back and do a re read. Loved your list, and I think the same way you do on most everything. Since hubby is finally busy doing something else I got a chance to listen to the videos. Oh my! I haven’t listened to Queen in ages. One of my favorites. Bless his heart, Freddy Mercury just didn’t last long enough, what a talent he was. The Bocelli album was beautiful! Of course I didn’t understand the words but between the tenderness of the lyrics and the warmth and beauty of the music, I had tears in my eyes. How unique with the 2 voices blending like that. Ahhh, what sweet memories with the Queen group and the warmth of the album, thank you so much for posting them. OH! The science version of Bohemian Rhapsody was so funny, I sent the link to my daughter. (she’s also becoming a fast fan of yours too). I’m glad you enjoyed the music! It’s too bad I haven’t been blessed with a good singing voice, because I love music so much I can’t help singing along. But I don’t do it if anybody is listening – I’d rather keep my friends. Awe Thank You for the mention Diane. Yes I am definitely guilty of not only slacking off in the writing aspect of my blogging but in the participation of nominating process of WordPress’s best bloggers awards. I congratulate you on yours. I seem to have gotten lost in the music I post on as it is my drug of choice & passion. Very much celebrate Christmas though with most all of my family & relatives gone find this time of year I get very depressed. I do Thank God that my Mom is still here but some very stressful stretches of sickness keep the worrying at times what seems to be endless. We did have a pleasant Christmas Eve together along with my part time boyfriend, lol. Hope your Christmas was joyous & peaceful. Thanks again for the mention, very much appreciated. I liked the format and enjoyed your comments. Well deserved award. Hope you had a great holiday, and thanks again!